Have a fun time this holiday season with the Santa Squirrel that can be pulled in all directions, so you don't have to be! This interactive Holiday Pentapuls Dog Toy - Santa Squirrel has 4 layers of nylon which make this a durable, superb toy for shaking, tugging, and general rough housing. This dog toy will keep your dog distracted for hours. 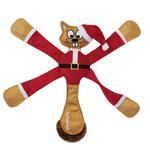 Pentapulls are classic must have dog toys that make a perfect gift for your best friend. Made with Eco-friendly recycled materials. Nice products with a wide variety of merchandise.